To see what’s been going on in the Twitterverse, I put together two Storify posts for you. 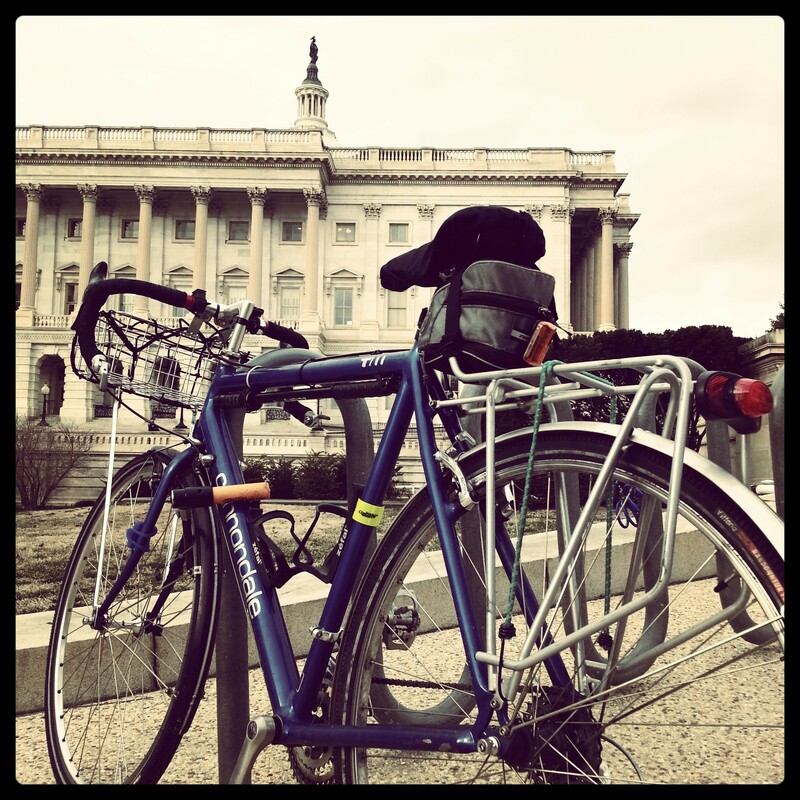 See part one, “Getting out, getting stuff done, and riding your bike = Errandonnee,” here, and find part two, “Oh the places you’ll go when you do the Errandonnee,” here. Many people use Instagram to document their errands and you will see a nice visual stream of those if you click this. Others use flickr to document their rides. Rootchopper set up an Errandonnee 2014 flickr group for us so feel free to add your pics to the mix. Also, today I received a lovely Errandonnee flickr set from stakx that I highly recommend you check out. 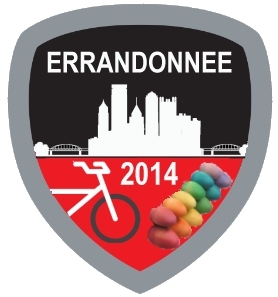 This is the special badge you receive in Pittsburgh if you finish the Errandonnee! Courtesy of Vannevar. Meanwhile, here is some Errandonnee news from the blogs, which are from various places here on planet Earth. Errandonnee is a Word with TripleDouble Letters, Bicitoro writes on her blog. I can’t get enough of the title of this post! Randy and Nova’s Bicycle Scrapbook— an errandonneur, errandeur, person running errands by bike in Kansas! Red Riding writes about “Lots and Lots of Errandonnee” in Pittsburgh, Pa. And see part 2 here. 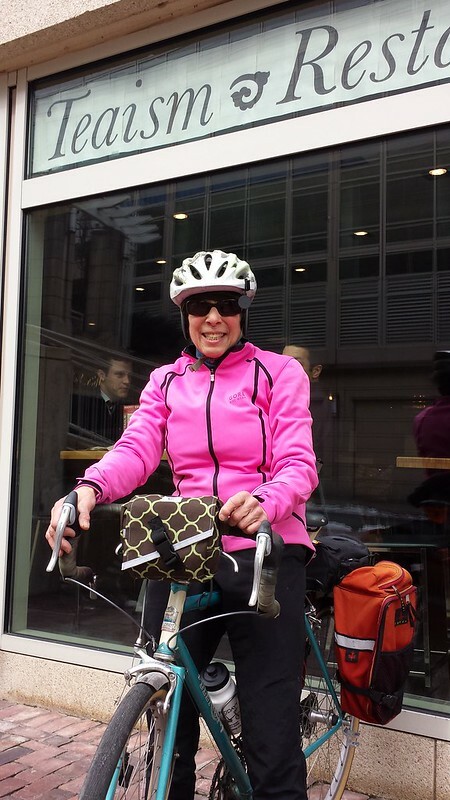 She is Pittsburgh’s first official Errandonnee finisher! The case of the missing shampoo bottles leads to trip to the general store. An Errandonnee by Tuckamoredew in Edmonton, Alberta. Lynne boldly takes her bike into almost any store that has room for her bicycle! She writes about her recent trips around Portland. The Coffeeneuring Regional Office is also doing the Errandonnee, and he’s almost halfway done, depending how one categorizes it. I’m getting hungry looking at this post, which includes a delicious-looking dish of Bibimbop. Vannevar in Pittsburgh, so glad you are errandeuring! A winter errand to Dairy Queen, Kent Fackenthall writes. Did you know a Blizzard will fit into a bottle cage? Well, sort of. Velovoice has such a pretty Brompton! See it in this write-up of her first two errands for the challenge. Life in the Cycle Lane learns that squirrels are mischievous. Also, see his nice Surly Ogre setup! A car repair by bike? Rootchopper gets it done. MORE BROMPTONS! Brompton Diaries gives the Errandonnee a go again this year. Seven trips down, five to go! Did I miss you? Let me know in the comments! Finally, if you have not started the Errandonnee yet, but still want to do it, there is still time to join. The Errandonnee goes until the 19th of March, the day before spring officially begins. So they say, anyway. Thanks for the shout out, I’m having a great time doing this challenge! I got out for two days of errands before being buried in snow. Fingers crossed, I may complete it yet! I’ve been traveling the last few days, and I’m finally back at home and reunited with my bike! It’s gorgeous and sunny, and I think I’m going to play hooky for a few hours this afternoon and knock out some errands. I’m halfway done. My goal this year is to get an entry in every category, because I’m competitive like that. One more to go for me. I put all my entries in one long post of rediculousness. I’ll get it up tomorrow when I finish with another epic ride to Safeway!! This has been great….thanks for the motivation! An epic ride to Safeway?! Can’t wait! I finished up. I sent you an email with my control card and post link. if you don’t get it let me know or here is the link.